This is a great dish to make when Asparagus are in season but also a great dinner party starter dish that can be made at any time of the year. If making for a dinner party, you can do some of the preparation in advance so that it's ready just to be put in the oven when your guests arrive. Allow about 20 minutes in total. You can obviously use any garnish you wish, maybe just a few mixed leaves or rocket. You could also use an alternative cooked ham very finely sliced such as a Spanish Jamon. If making for a dinner party, you could proceed to the end of step 2 and leave the remaining steps until your guests arrive. Trim the think base of the Asparagus and blanch in boiling water for a couple of minutes, remove and refresh under cold water. 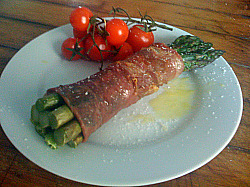 Wrap the slices of ham around the bundles of Asparagus and place in lightly oiled oven proof dish.